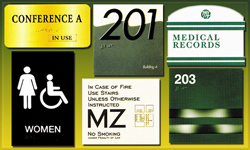 Let Sign-Age be your experts on the requirements of signing your locations for the Americans with Disabilities Act. ADA provides those with special needs, access to public places. We’ve studied the law and have determined that, in certain instances, signs alone can bring you closer to compliance. Other times the law may require modifications to your physical plant. Sign-Age can recommend materials to fit your budget and enhance your image throughout your facility! Contact us today for a personal representative to assist with your customized needs. Or help youself to many choices and designs through our SignMojo brand. You can customize your own ADA signs and order on line in a few simple steps!